This book is a comprehensive textbook designed to introduce graduate students to research methods and techniques used in observational measurement of behavior, along with the theoretical principles underlying these methods and techniques. The aspects of observational measurement addressed are highly relevant to special education, communication sciences, psychology, social work, and related fields. 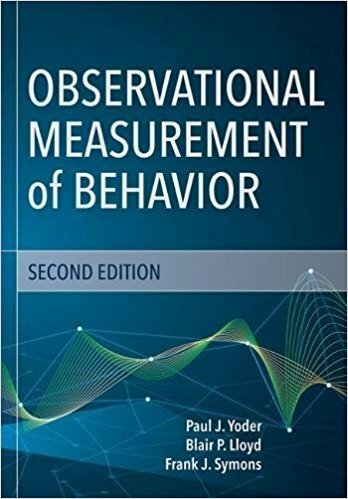 Chapters 1–8 discuss foundational topics in observational measurement of behavior: systematic observation, validity and reliability, measurement theory, the development of coding manuals, coding, common metrics of observational variables, observer training, interobserver reliability, and more. Chapters 9–11 address advanced topics: sequential analysis, research questions involving sequential associations, and generalizability theory. Chapter 12 is a "'wrap‐up" chapter summarizing best practices for observational measurement. Each chapter begins with an overview of the topics covered and ends with the authors' conclusions and practical recommendations regarding aspects of observational measurement. Throughout, the authors provide real‐world examples based on their extensive experience studying communication behaviors. Recommended methods are discussed in relation to currently available observational software. Definitions of key terms are prominently featured in the text and compiled in the Glossary. The online companion materials include exercises and assignments that provide opportunities for readers to apply the principles and practices discussed throughout the book; these comprehensive documents are an excellent resource for course instructors.